The withdrawal of Obiageli (Oby) Ezekwesili, a former Nigerian minister from the presidential race, has pushed farther any quest for a female Nigerian president. Mrs Ezekwesili withdrew from the presidential race last month shocking her teeming supporters. For the record, no woman has emerged president, vice president or even an elected governor in the 19 years of Nigeria's recent democracy. Since 1999, women have not reached 10 per cent representation in government, a Fact Sheet by Centre for Democracy and Development (CDD) shows. When will Nigeria ever produce a female president? This quest was reinvigorated ahead of the 2019 elections. With 91 political parties now, women had a better chance compared to their five previous outings at the presidential polls. In 1999, no woman contested as only two candidates, Olusegun Obasanjo of the Peoples Democratic (PDP) and Olu Falae of the Alliance for Democracy (AD), slugged it out. Mr Obasanjo emerged the winner. However, 2003 remains women's best attempt at occupying Aso Villa. Of the 20 presidential candidates, two were women - Sarah Jubril of the Progressive Action Congress, (PAC) and Mojisola Adekunle Obasanjo of the Masses Movement of Nigeria, (MMN). Mrs Jubril scored 157,560 votes, the highest any woman has ever got in a presidential election in the country. Since then, the fortunes of women dwindled at the presidential polls. In 2007 and 2011, only one woman contested. The poor run continued in 2015 where Oluremi Sonaiya, was the only female in a crowd of 14 presidential candidates. Hope rose in 2019. Of the 144 presidential and Vice-presidential candidates expected to run, 28 women are on the list as either the candidate or running mate. Even though she joined the race late, Mrs Ezekwesili added steam to the quest for a 'Madam President'. Many believe women in the presidential race are only there "to test the waters" and not actually contesting, an assumption the former minister would vehemently dispute. From the moment she declared for the presidency under the Allied Congress Party of Nigeria (ACPN), Mrs Ezekwesili secured a spot for women among top contenders. She was the only female candidate selected to participate in the major presidential debate organised by the Nigeria Election Debate Group and the Broadcasting Organisations of Nigeria. Quite frankly, she did not let her guards down throughout her campaign until she bowed out from the race a few days after the debate which held on January 19. Mrs Ezekwesili indeed has a track record to lead the charge for women in the presidential race. The 56-year-old spent the better part of her political foray helping others implement their policies by applying her vast experience in chartered accounting and International Law and Diplomacy. She started off in the Olusegun Obasanjo administration as the pioneer head of the Budget Monitoring and Price Intelligence Unit (aka Due Process Unit). It was in this position that she earned the sobriquet of "Madam Due Process" for the outstanding work she led a team of professionals to do in sanitising public procurement or contracting at the federal level in Nigeria. Mrs Ezekwesili was the architect of the Bureau for Public Procurement legislation, the NEITI legislation, and the new Minerals and Mining legislation during her six and a half years stint in government. She was appointed Minister of Solid Minerals (Mines and Steel) in June 2005 during which time she led a vibrant reform programme that led to Nigeria's global recognition as a credible mining investment destination. The former presidential candidate of Allied Congress Party of Nigeria (ACPN), was also the chairperson of the Nigeria Extractive Industries Transparency Initiative (NEITI) and led the first ever national implementation of the global standards and principles of transparency in the oil, gas and mining sector. In June 2006, Mrs Ezekwesili was appointed the Federal Minister of Education, holding this post until she took up her World Bank appointment in May 2007. Recognized both locally and internationally for her exploits in and out of government, Mrs Ezekwesili must have secured herself a spot among the few greatest women Nigeria ever had. However, away from that euphoria, the staggering reality of her rather precipitous decision to pull out only 23 days to the D-day snowballed into a cold war between the former minister and the ACPN. Moments after she announced her withdrawal from the race, which she said will help build a coalition to defeat the All Progressives Congress (APC) and the Peoples Democratic Party (PDP), her now estranged party ironically adopted the president, Muhammadu Buhari of the APC, as its candidate. The party alleged that she only used it as a platform to secure a ministerial appointment and that she had party properties still in her possession, including cash donated for her campaign. The former World Bank leader would vehemently deny these allegations. 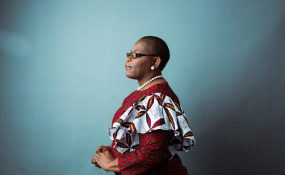 The foregoing however put to test the seriousness of Mrs Ezekwesili's candidacy in the first place and would further allude to the "just to test the waters" cliché for women in the presidential race. Her supporters would have loved her to see the race through even if she did not win, just like Sarah Jibril, Nigeria's first female presidential candidate both at the primaries and main elections, having contested to be president on four separate occasions. Sarah Jibril, former special adviser to the president on ethics and values. A professor at the Department of Political Science, University of Nigeria, Nsukka, Jonah Onuoha, described Mrs Ezekwesili's withdrawal as "embarrassing and suspicious", saying she must have been working for another party all along. Tope Fasua, the candidate of the Abundant Nigeria Renewal Party (ANRP) and a participant of PACT before the arrangement crumbled, remained indifferent despite the call by Mrs Ezekwesili to form a coalition. Mr Fasua suggested that Mrs Ezekwesili's call may be an attempt to "achieve a certain predetermined goal." Mrs Ezekwesili pioneered the Bring Back Our Girls (BBOG) advocacy group for the release of the Chibok girls and later dropped her leadership spot at the BBOG for her presidential position. As much as she would try to justify her reasons for stepping aside, her last minute change of mind will have little or no impact as the duration for withdrawal elapsed last November, according to INEC, the election umpire. What will trail her political career and perhaps, serve as a reference point to the quest for a female Nigerian president in future is the drama around her withdrawal. Again, the presidential polls already appear to be another tale of misrepresentation for women. Just like Mrs Ezekwesili, other women have also withdrawn from the race at the last minute even though their names will still appear in the ballot. While the candidate of the National Action Council (NAC), Rabia Hassan Cengiz on Saturday said she stepped down to support the Mr Buhari, Funmilayo Adesanya-Davies, the candidate of Mass Action Joint Alliance who withdrew earlier is now backing Atiku Abubakar of the PDP. Eunice Atuejide, the candidate of the National Interest Party, is perhaps the only known female candidate still gunning for the top job. What is left to be seen however is how she would face the glaring odds in a male-dominated contest, three days from now. This project is powered by Centre for Development and Democracy (CDD) with support from Ford Foundation. The initiative is aimed at enhancing issue-based campaigns ahead of the 2019 general elections. What Would Fela Say Ahead of Polls?